There is nothing that quenches my thirst on a hot summer day quite as well as an icy glass of fresh squeezed lemonade. I honestly cannot think of beverage I enjoy more. It’s tart and sweet and utterly refreshing. Whether it’s straight up lemonade or a fruity lemonade infused with herbs or flowers, I take mine with plenty of ice and by the quart. 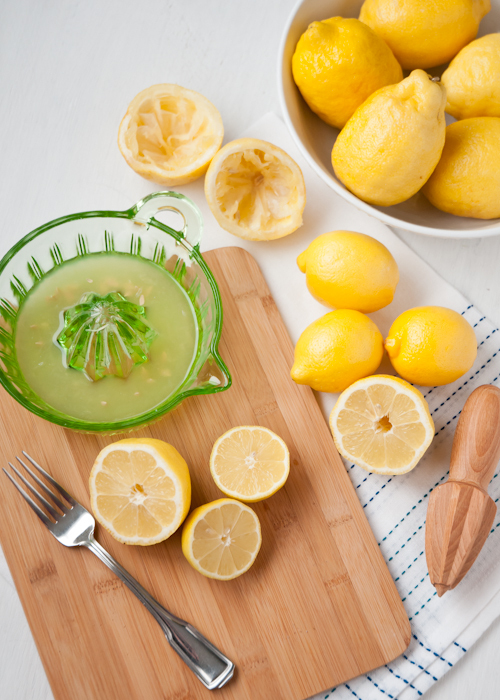 Read on to find out my secrets to Sweeten Up your summer and make the perfect pitcher of lemonade. Get ready to get refreshed. Let’s begin with talking about lemons. The ones you’ll find in the grocery store are typically the Lisbon and Eureka varieties that are grown mostly in California and Arizona. In reality, there are a dozen or so different varieties, but 9 times out of 10 these are the ones you’ll see in stores. 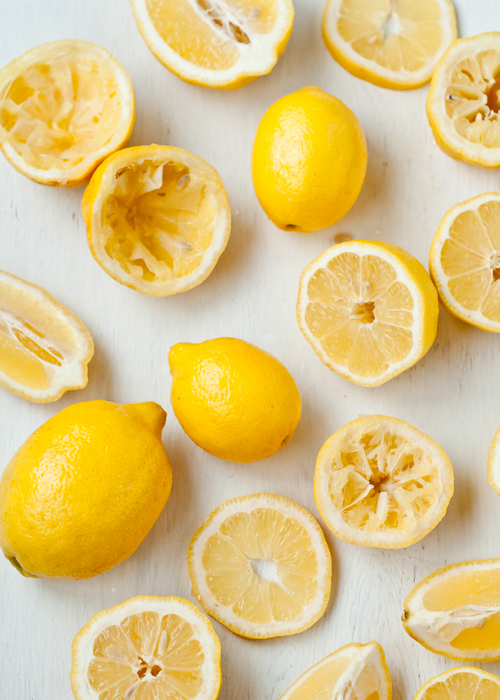 Another lemon variety you’ve probably seen on store shelves during the winter and spring months is Meyer lemons, which are actually a hybrid of mandarins and lemons. They are sweeter and juicier than traditional lemon varieties. They make fantastic lemonade, and if you can find them on sale somewhere at the end of the season, stock up! The extra expense is worth it when you taste the superior lemonade. 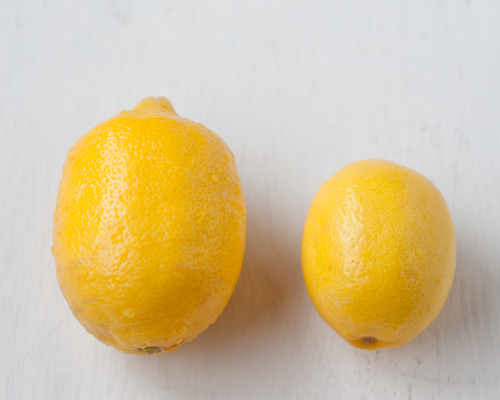 One extra large lemon yields about 1/2 cup of juice (pictured on the left) and one regular-sized lemon yields about 3 Tablespoons of juice (pictured on the right). A lime is about 2 Tablespoons. This might vary a teeny bit depending on the size of the lemons you’re using. And even then, I’ve bought some lemons that were huge and ended up having thick rinds and very little juice. Secret #2: Buy a few more than you think you might need just to be safe. 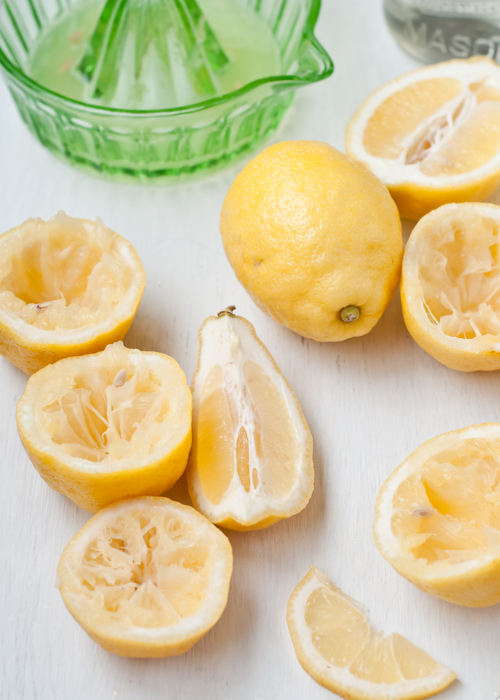 You’ll need about 5-6 regular lemons to yield 1 cup of lemon juice. 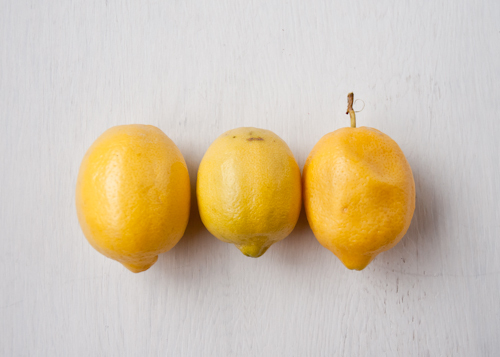 From left to right: a perfect lemon, an under-ripe lemon (it’s hard to see but it’s still a little green), a mushy lemon. When you’re picking out lemons, pick out those that have a nice bright yellow color (not tinged with green), don’t look too dry or shriveled, are free from mold or bad spots, and are heavy for their size. You can give them a little squeeze. The juiciest ones, I find, aren’t mushy, and give a little when pressed. If you’re buying lemons in a big bag (they are a little less expensive when purchased this way), just be sure to turn the bag around and inspect them carefully. Have you ever bought a bunch of lemons and one goes moldy and then the next day they’re all moldy? Yeah, me too. Washing them really well when you get home will help with that, and be sure to store them on the counter. 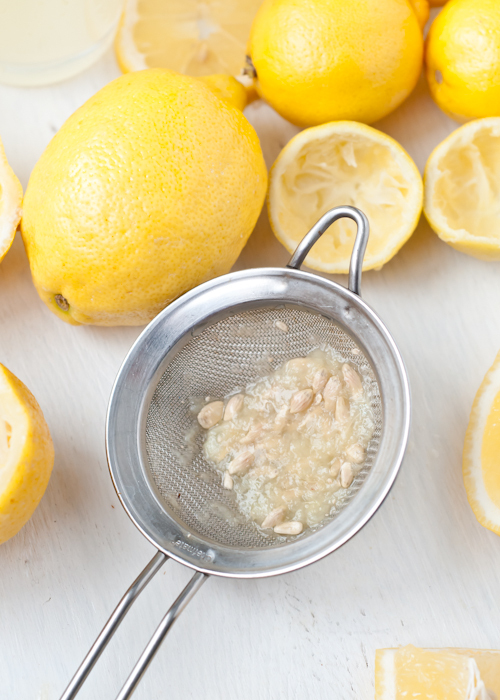 Now, there are several ways to physically juice or squeeze a lemon. Some impressive chefs with equally impressive, toned arms can squeeze a lemon with their bare hands. Me? I like to use either a fork, a wooden reamer, an electric citrus juicer (if I’m doing a lot at once), or a glass citrus juicer with a reservoir to catch the juice. There are some great citrus squeezers available too. Another thing I’ve tried is to squeeze a lemon using a pair of tongs. You place the lemon close to the hinge and as you close the tongs, the juice is released. A fork is probably the method I use most because it’s so simple. You just cut the lemon in half crosswise, hold half in one hand, push the fork into the center and twist. This kind of goes without saying, but you’ll also want to strain out the seeds. Secret #4: When you measure the juice, be sure to do it after you strain because you will lose some volume when the seeds and some pulp is removed. If you like pulp, remove the seeds from the collected juice with a fork. Lemons, of course, are very sour. They need some kind of sweetener to tame the tartness. 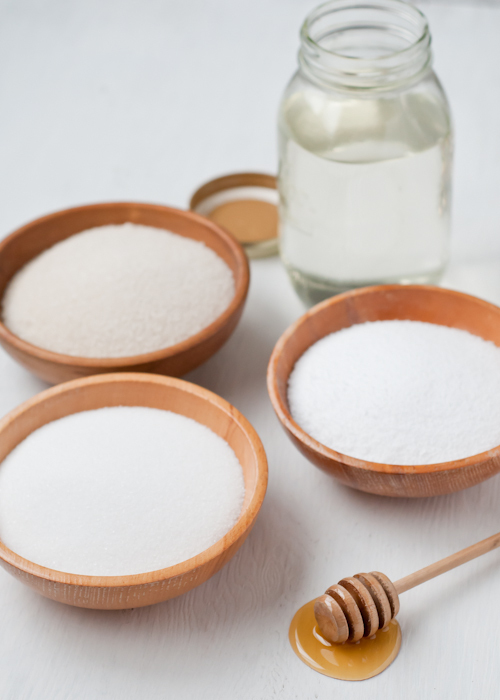 There are all sorts of sweeteners out there that you can use from basic white, granulated sugar to honey to artificial or natural low-calories sweeteners. This is kind of up to you and your taste preference. Granulated sugar will give you the purest taste. A less refined sugar, like raw sugar, sucanat and others, will have more molasses flavor and make the color of the lemonade a little darker. It’s really up to you what you decide to use. For this post, I’ve used granulated sugar. Sometimes it’s difficult to get the sugar to dissolve in the water, and you can purchase superfine sugar which will dissolve more readily. But if you remember back to chemistry class, for something to completely dissolve in water, you’ve got to add enough water, or a little bit of heat. Secret #5: What I’m talking about here is called a Simple Syrup. If you make cocktails and drinks at home, you already know how to make it. This is my preferred sweetener for lemonade for several reasons. 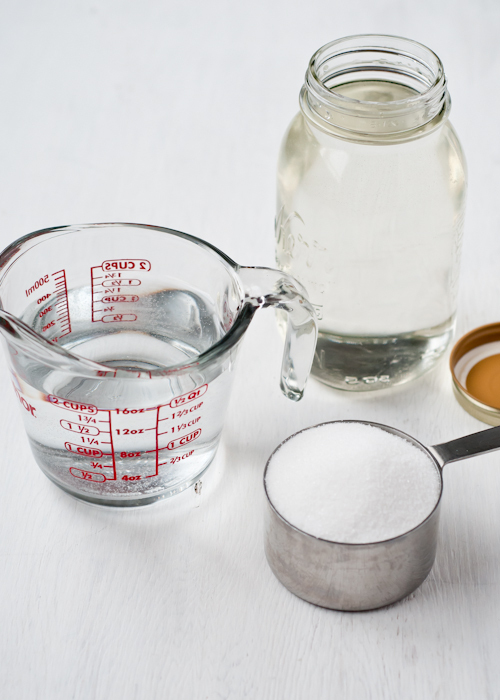 A simple syrup is nothing more than mixing sugar and water together, boiling it quickly for the sugar to dissolve, transferring it to a bottle and chilling it. It will keep almost indefinitely, but I tend to use mine within a few weeks of making it. Why do I love using simple syrup for lemonade? It can be infused with fruits, flowers, spices and herbs to make a flavored syrup. Right after the syrup comes to boil, I will add the flavor components and take the pan off of the heat. As the syrup cools, the latent heat helps release the flavors (essential oils) into the syrup. The solids (leaves or petals or woody bits) are strained from the syrup and you’ve got yourself a flavored syrup, perfect for mixing into lemonade and other drinks. I’ve included more specific directions below. There are several recipes out there for simple syrup. One part sugar to one part water will provide a thick, concentrated syrup. It takes up less room in the fridge too. One part sugar to two parts water is another common recipe. It’s up to you which you choose. As I said, I mix the water and sugar in a saucepan, and bring it to a boil. The sugar dissolves pretty easily. The whole process takes less than 5 minutes to complete. Now for the really fun part — making flavored lemonade. 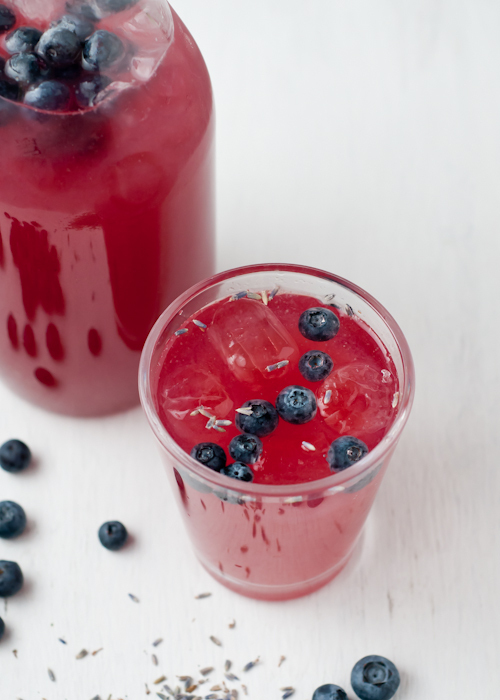 By adding fruit puree(s), herbs, floral components, and spices, the possibilities are truly endless. I like homemade fruit syrups to add to lemonade, but if you’re in a hurry you can use the same syrups you use when making Italian sodas. 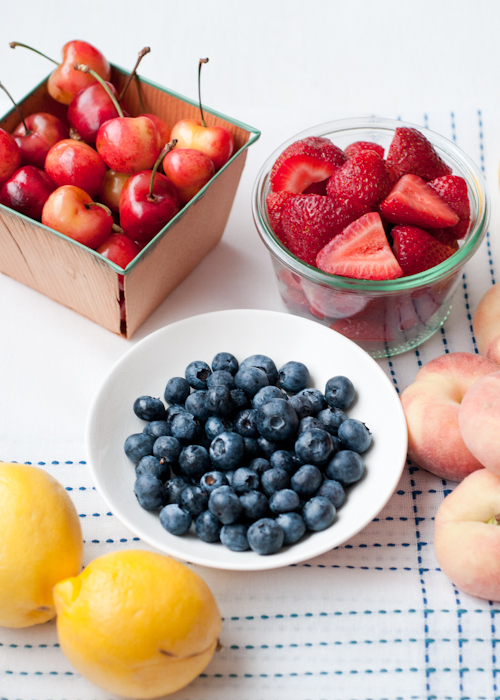 Secret #6: Adding fruit puree does change the amount of sugar you’ll need. 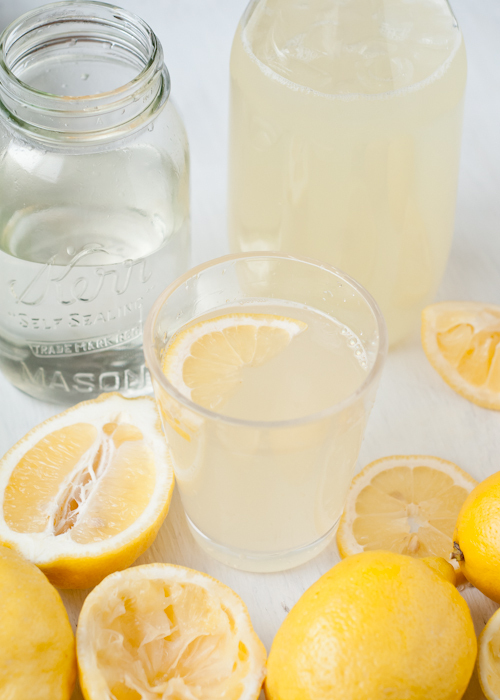 Which means you might need to make a little experimentation on the basic lemonade recipe because the sweetness and tartness of fruit varies greatly upon the kind you use and how ripe it is. 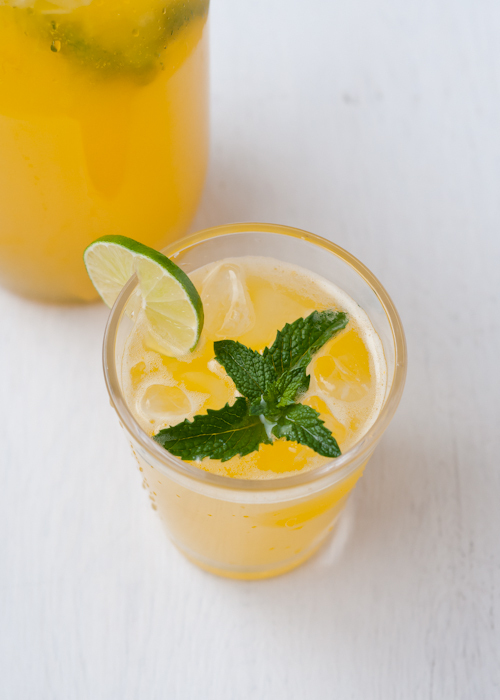 If you make lemonade using ripe melon juice for part of the water, you might not need to add any sugar at all! 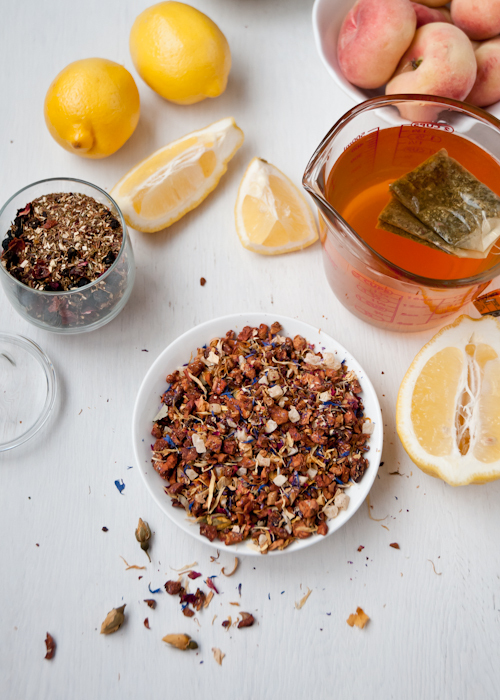 Another variation we really love is made by using cold herbal tea (black, green or white tea is great too) in place of plain water. It’s incredibly refreshing. You can use loose tea or tea bags. Make it a twice as strong as you would if you were drinking it hot so the flavor doesn’t become too diluted. 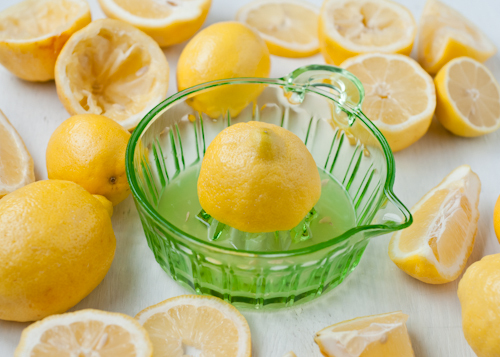 While we’re on the subject, Secret #7: you can do several things to keep lemonade from becoming too diluted. The easiest thing to do is use less water and more ice. 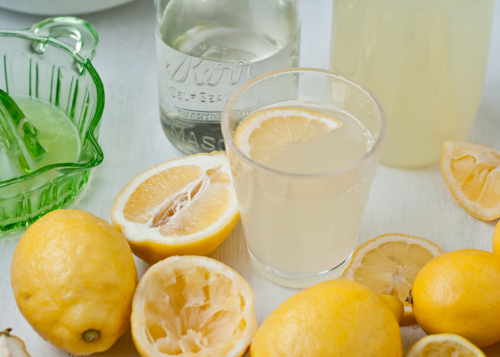 Then as the ice melts, it doesn’t dilute the lemonade too much — maybe just the right amount. Another is to a large ice ring which melts more slowly. Or you can plan ahead and make lemonade ice cubes. You can even freeze fruit to put into the lemonade in place of, or in addition to, ice cubes. And there are specific pitchers that have a tube in the middle of them that is filled with ice that doesn’t come into actual contact with the beverage so it doesn’t become diluted. Lemonade will keep in the fridge for a few days. If you plan on keeping it for longer, you might want to consider making a concentrate (recipe below) and freezing it. 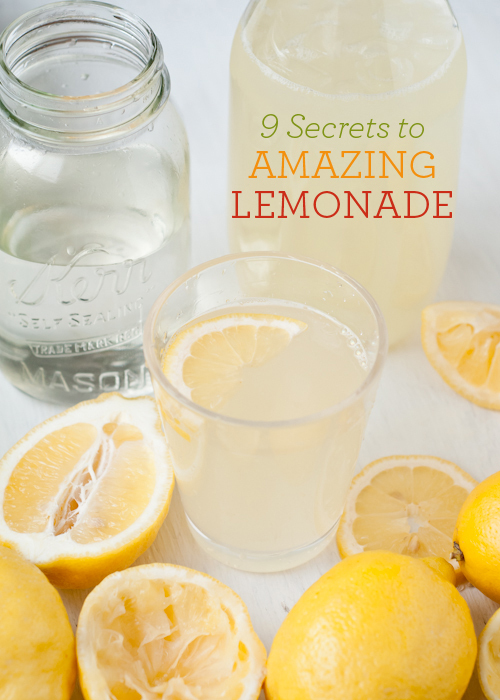 Secret #9: To make lemonade for a crowd, plan on two to three 8-ounce servings per person — more if it’s really hot outside. (If I’m coming to your party, plan about one quart or more just for me. : ) For 50 people plan on making between 6-9 gallons of lemonade. Stir lemon juice, simple syrup, water and ice together in a pitcher and serve. Stir together in a saucepan and bring to a boil. Let cool and transfer to a bottle. Chill until ready to use. 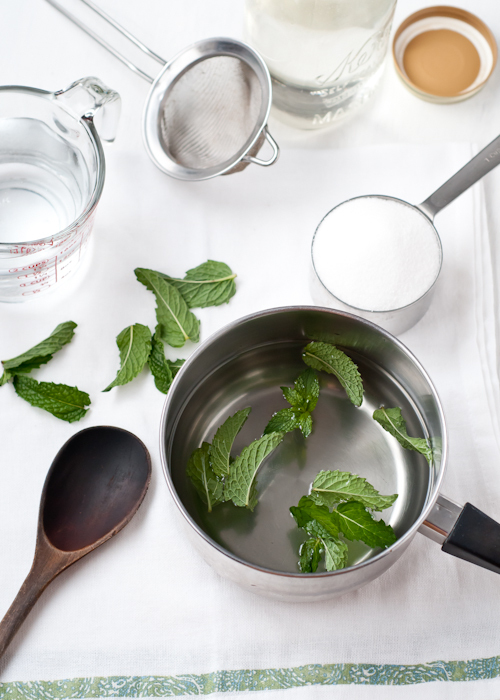 Additions for flavored syrup: fresh mint, tarragon, basil, thyme, rosemary, lavender buds (make sure you buy culinary lavender or use homegrown without pesticides), organic edible flowers, slices of fresh ginger, whole spices, etc. 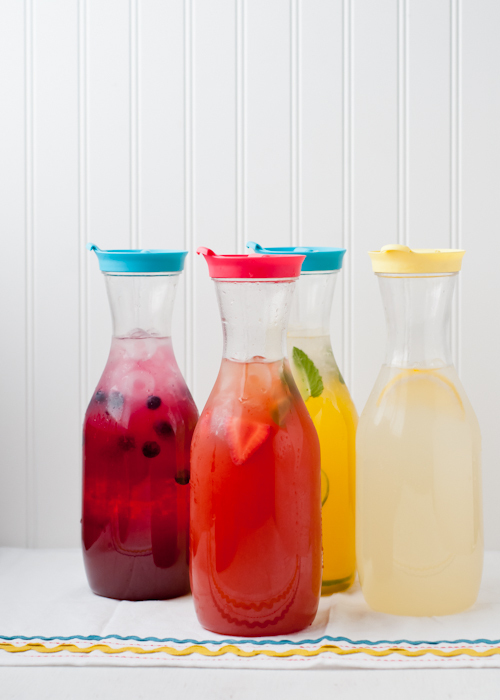 Add 1/2 to 1 cup fresh fruit puree (strained to remove seeds if desired) to basic lemonade recipe. You can also add fresh or bottled fruit juice (like cranberry juice) for part of the simple syrup and water. 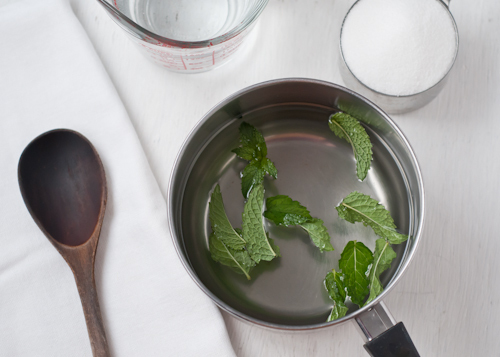 Bring to a boil to dissolve sugar. Remove from heat and transfer to a jar and refrigerate. Mix 1 cup fresh lemon juice with the Simple Syrup II. Chill. Puree fruit, sugar, and lemon juice. Let sit for sugar to dissolve. Add cold water. Taste and adjust sugar or lemon juice. Now, I’d love to know what your favorite lemonade flavors are, Design Mom Readers. Are you a purist? Or do you like to play around with different flavors like I do? Do tell! P.S. 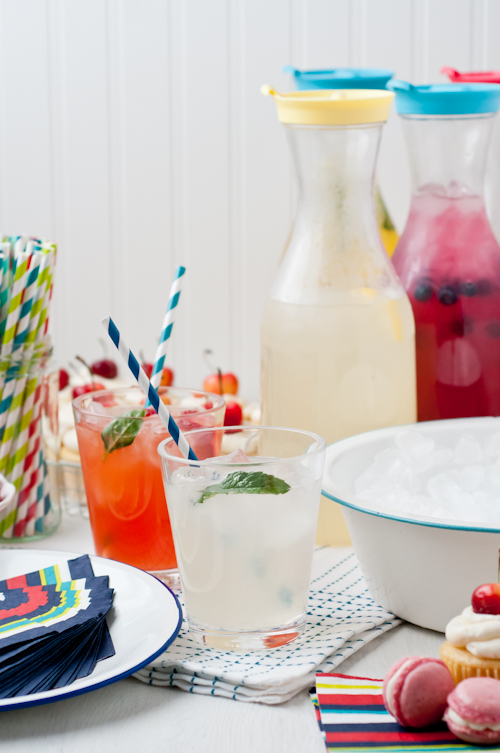 — All the cute props for this post came from Target: striped paper straws, striped paper napkins, dishtowels, acrylic cups (in-store), carafes (from the dollar spot), measuring cup (in-store). And you can find all of my Secrets To Living Well here. I love this! And it’s way more than 9 secrets. I’m definitely going to be making some of these lemonades. And I have some ideas involving passion fruit and herbal tea now! Thank you! We got an electric citrus juicer from amazon for $10 to make lemonade for our wedding, and it has remained one of our most used kitchen appliances. It’s so much easier to use than trying to juice by hand. Saves you time, and is more effective, so also saves you money! Thanks for the tips! I’ve been wanting to perfect a lemonade recipe and think I can do it now! Just add a tablespoon or two of lemon zest and it’d be perfect! It adds even more lemony goodness. 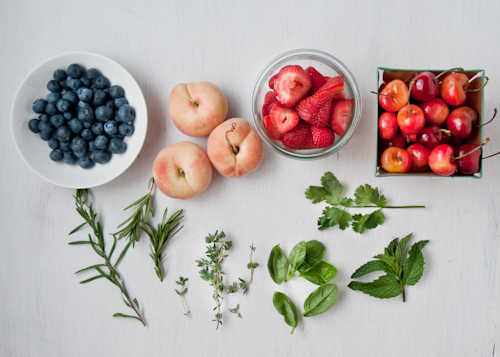 And our favorite is to add strawberries or raspberries fresh from the garden! I’m literally drooling. This looks so refreshing!!! Mmmm!! Bring on summer! I bookmarked this page… so fun, thank you! This is perfect! My lemonade is always either too sweet or too watery. Thanks! In India, our favorite variation on lemonade is as follows; fresh squeeze lemon juice, simple syrup, club soda and a pinch of salt. For some reason the salt brings it all together and makes it something refreshing and unique. Highly recommend! We are having a lemonade stand tomorrow! These recipes are inspiring! This is a wonderful post! 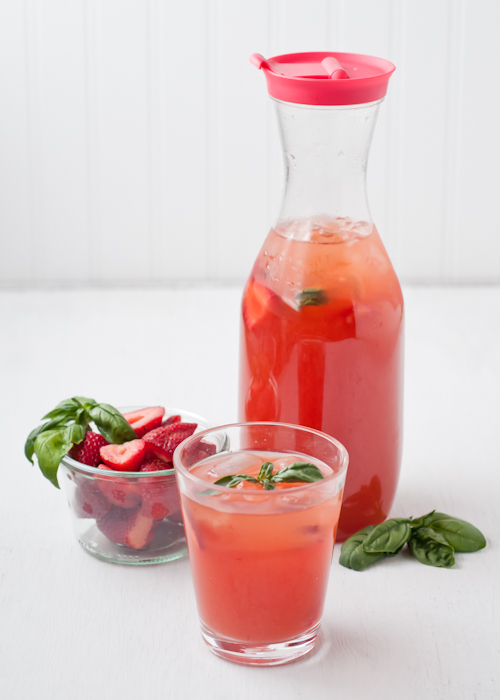 One of my goals this summer is to make the perfect strawberry lemonade so this will definitely be my go to reference. Thank you! 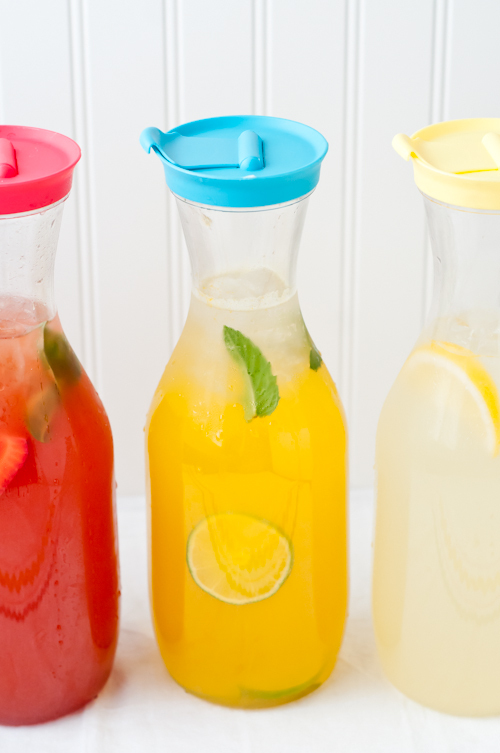 Will definitely try your lemonade this summer! you never cease to amaze me! better than martha stewart! ;) i couldn’t resist i just had to link you up to my friday sweet links! Hello, I lived this post! Is the the ones you have? It looks a little different but yours look so fun and continent that I want to get some for the summer! We made this with a 5 year old and had a great time…Thank you!!! This lemonade looks so amazing. We have a Jack Lalane juicer. We put rinds in and pits–the juicer sorts it out. Fun and easy! This is beautiful! 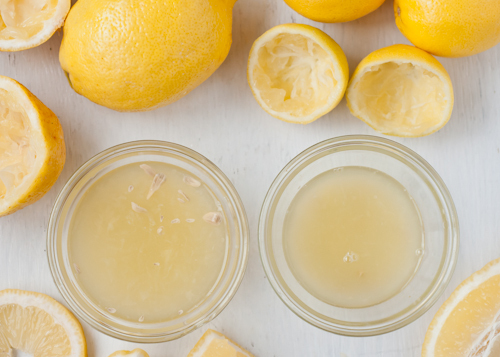 We love lemonade experiments, too. Last summer I made a black pepper lemonade that turned out great (much to my husband’s surprise!) I dropped about 1 Tbs of whole black peppercorn into the lemonade, let it infuse overnight, then strained them out. The lemonade was still sweet and tart, but had a fun peppery aftertaste that I found super refreshing! i loved the secrets ! however my family also adds grated lemon peel. do you know about it? and refuse to use? i really love your posts! thanks a lot! Thanks for sharing these secrets! Next time I make lemonade I’ll keep them in mind! I linked these tips and recipes in my blog as we used it to learn fractions today :-). Thanks for the recipes. Thanks for the awesome tips and recipes! I’m so pumped to try them! 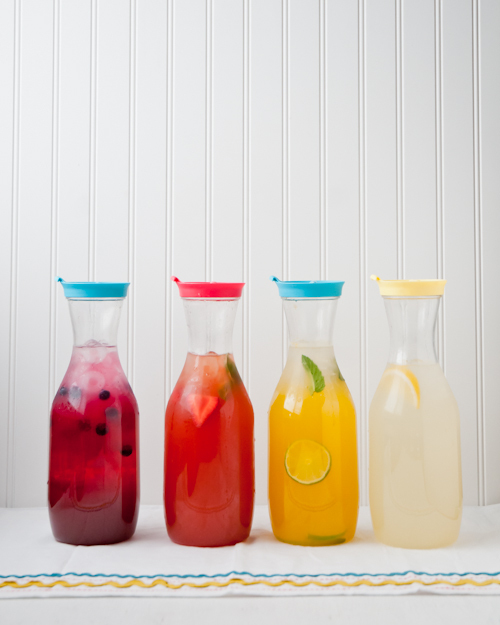 And where did you get your cute pitchers?? I’m wanting to make Lemonade Guest Favours for a party. 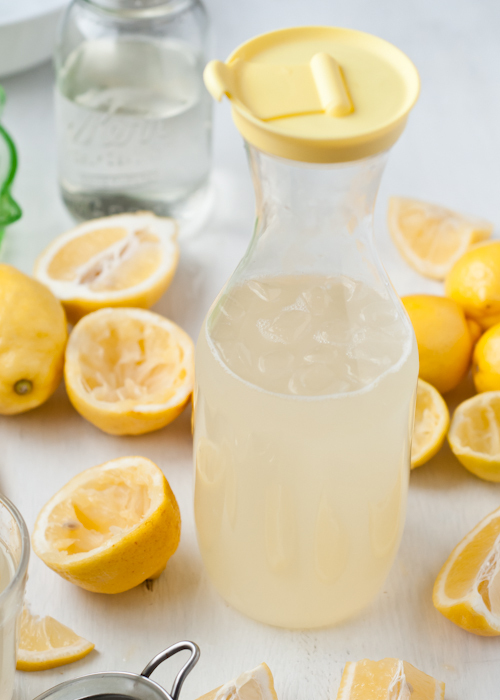 Will lemonade keep in swing top bottles at room temperature (and for how long) or does it need to be refrigerated? Hello and thank you for these awesome tips! I tried it out yesterday with brown sugar and basilikum in my simple sirup. However it was far too sweet to drink. In the end I had to use like 10 cups of water for one cup of lemon juice and two cups of simple sirup. For the simple sirup I used two cups of water and one cup of brown sugar. And I don’t really believe brown sugar to be sweeter than white sugar. Maybe I’m just not used to the sweetness of lemonade as the Swiss do not really seem to have a lemonade tradition. We usually drink cold tea or sirup as far as homemade refreshment goes. But I kinda doubt that. Well for the next time I just know to use way less simple sirup. 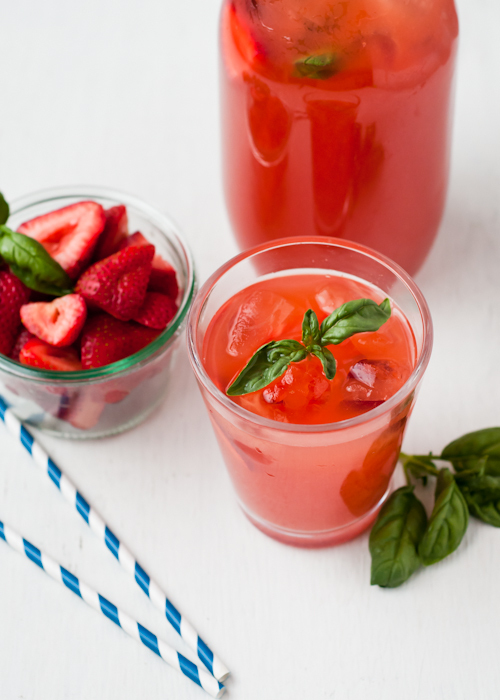 I just made strawberry basil lemonade using your tips, and it is almost heavenly. I will for sure be trying out some more of these combinations. I have a rosemary bush in the backyard, so peach rosemary might be next. Thanks for this guide! Wow! There’s not much better than “real” lemonade especially on a hot summer afternoon. I love all the great ideas to refreshen an old favorite. I know it’s cheating but what I do is make 2 separate pots of strong tea, usually one black the other herbal. When I consider them ready (sometimes hours if I use cold brew method) I remove the tea & make a third pot rebrewing the the first two tea leaves together. I then mix the three pots with one can frozen lemonade. Throw in a fresh lemon or lime & a bit of honey. Next day you’d never know it was from a frozen mix and everyone thinks I slave over my “artisinal Arnold Palmer”. I would like to know if someone can help me make an activated charcoal lemonade using Stevia, Honey, Agave and Date Syrup. I am trying to make one and use this before my birthday! Cool tips nice pictures. I however omit sugar from all of my drinks if I can help it especially from my lemonades during the hot summer days. 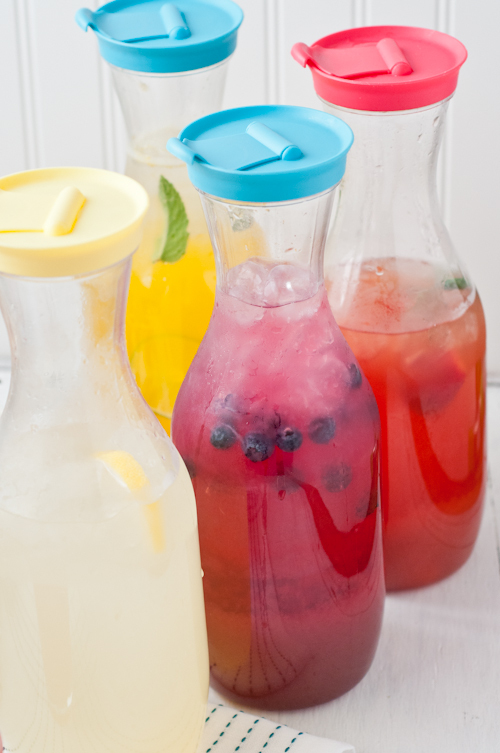 Thank you for amazing homemade lemonade which can help to enhance your taste.